Take a cruise down the Murray River on board a historic paddleboat. Departs from Mildura daily! Milduras Original Steam Driven Paddle Steamer. Relive the sights and sounds of the pioneer days with a relaxing and informative cruise. Originally built for the Victorian Government as a work boat in 1912, the Melbourne was restored to a passenger carrying steamer in 1965. Cruise daily on the P.S Melbourne for a 2 hour cruise down stream through Lock 11. Kiosk facilities onboard with light lunch available. Comprehensive river commentary. All weather boat. 10.50am returning at 1.00pm and again at 1.50pm returning at 4.00pm. 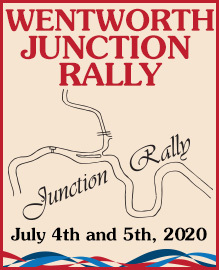 NOTE: P.V Rothbury does this cruise on Fridays, Saturdays and off peak. Built in 1881 as a large powerful tow boat, the Rothbury is renown as one of the fastest paddleboats on the Murray River. 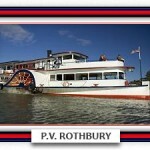 Every Thursday the Rothbury departs the Mildura Wharf sharply at 10.30am to cruise to the Award Winning Trentham Estate Winery, where passengers are treated to a tour and tastings at the Winery, a BBQ lunch with salad and sweets and an expert River Commentary, before returning back to the Mildura Wharf at 3.30pm. 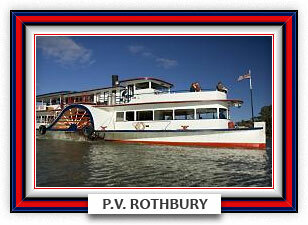 Every Thursday night the Rothbury departs the Mildura Wharf sharply at 7.00pm returning at 10.00pm. Passengers are treated to a Choice Carvery Dinner with a fine sweets selection, live music and tea/coffee. 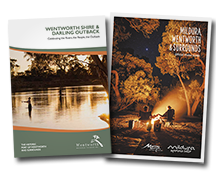 This is a wonderfully unique dining experience with powerful floodlights illuminating the River bank with wonderful River Red Gum reflections. Truly a magnificent experience. Tuesdays from September through to April (Excluding February) the Rothbury travels to the historic Gol Gol Hotel – Est. 1877, for a scrumptuous bistro lunch, with an expert River commentary as we cruise past the small scenic townships of Buronga and Gol Gol. 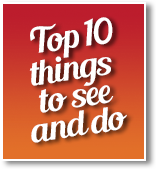 Cruises depart the Mildura Wharf at 11.30am returning at 3.00pm. 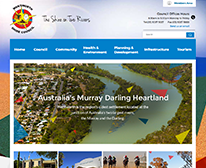 The P.B Mundoo specialises in group function hire – Conferences, Weddings and Social Occasions. The P.B Mundoo features quality timber decor, with elaborate dining facilities for up to 180 passengers. Make your Wedding, Conference or Birthday a truly rememberable experience for yourself, your guests or your delegates.